Get ready to celebrate International Women’s Day, this Sunday, March 8th. 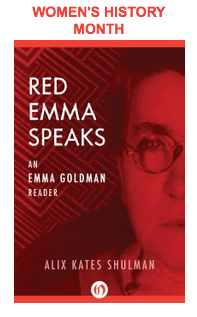 Early Bird Books has a deal on Red Emma Speaks, as their Women’s History Month Pick: Emma Goldman became a household name in the 1900s for her writing and speeches. This is the perfect month to learn about an early pioneer for women’s rights. This, and more, in their latest e-flyer. Also… do be sure to drop by the Library and check out the International Women’s Day Book Display.